If you didn't already know, Othmar Schoeck was an exponent of high and late romanticism. He wrote many lieder often of a gloomy nature. He had no time for the anarchic, the zany or the light-hearted. For him there was always tragedy around the corner even in moments of delight. That there should be three violin sonatas and a violin concerto comes as no surprise. The violin is after all one of the classic singers of the orchestra. And sing is what it does through these pages. In the 1905 work the Ruhig has classical moments which keep finding Schoeck's romantic North. They feel the magnetic pull ... the tension towards a new and knowing world of expression. Ironically it is the classical world that triumphs in the chiff-chaff finale. It recalls at first the sort of lively Piggesnie writing of Peter Warlock but then reminds us of Beethoven's Spring Sonata, the Mendelssohn Violin Concerto and even Mozart's K364 Sinfonia Concertante. Only in the first movement is the moonstruck romantic world of the Stefi Geyer-inspired concerto evoked. The mood and style of the piece is inconsistent. It is as if the last two movements had been sitting in a drawer only to be completed by a first movement that finds Schoeck in full mature voice. Speaking of which that is exactly what we find in the Op. 46 sonata where the violin becomes the gracious singer of the composer's soul. This contrasts with the sinister capering of the scherzo which even when it goes into trio mode seems to look over its shoulder into a landscape charged with foreboding. The final movement despite its marking Breit in fact leads us with a skeletal hand further into despond; at the last casting enamoured glances towards the first movement. The Op. 16 sonata is his earliest work not to be disowned by the composer. Its singingly poignant Mendelssohnian soul is touched with a dancing Tchaikovskian sensibility. The marks of the 1952 revision can be felt in the Schnelle viertel finale. For a change there is almost identical competition for this disc from a Guild recording made in 1997 by Paul Barritt and Catherine Edwards. That duo have championed the sonatas of Stanford, Ireland and Howells on Hyperion. Zgraggen and Koella are recorded more closely. In the more subtle world of the gorgeously melodic Op. 46 sonata the sound does not quite match the subtlety and distance of the Guild. There's not much in it and both duos produce highly poetic readings. Barritt's tone is more hoarse, has more gravel in the throat, than Zgraggen. Barritt injects more vibrato and overt emotionalism in his reading of the Kreislerian Albumblatt from 1908. 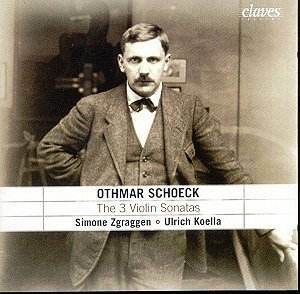 The piece was written in the first dazzle of Schoeck's love for the young violinist Stefi Geyer who very shortly was to marry a Viennese lawyer. Zgraggen takes a more tender and innocent line than Barritt. Give or take a handful of seconds there's otherwise little to choose between these two discs. Schoeck doyen Chris Walton provides the notes for Guild and Dominik Sackman for the Claves disc.